Are you looking for an affordable gaming pc build for a great price? How about the best $700 gaming pc build that can crush pc games at 1080p resolutions and even into 1400p resolutions? This may not be the cheapest pc build possible, but it assures quality and performance over anything, so that you can jump into pc gaming without scaling everything back all the time. The hardware below for the $700 gaming pc build is chosen based on two main things, performance and quality for the best possible price. All of the hardware is conveniently linked to Amazon. Best of luck when planning your next gaming pc build and should you have any questions feel free to get in touch. April 2019 Updates: The $700 gaming pc build include the very powerful budget cpu, the Ryzen 5 2600 and a powerful graphics card, the RTX 2060. This build could probably fulfill most standard gaming pc builders out there who simply want to game at high settings at 1080p resolutions. The CPU for March 2019 is the Ryzen 5 2600 CPU is a superb value coming in with 6 CPU cores and 12 threads at 3.4Ghz. This is a solid gaming cpu that is priced really well. The graphics card is the RTX 580 8GB (specifically the MSI Armor 8GB RTX 580). This card has so much potential when gaming at 1080p, and you should expect to max out most games at 1080p resolutions. The RAM included is a kit of Corsair LPX 8Gb RAM (the same as in the $1000 pc build) which is enough memory for most gaming pc builds, and you always have the option to upgrade more in the future if need be with the extra couple of slots on the included motherboard. The storage included is a Kingston Digital 240GB solid state drive SSD. This is a great start in terms of storage speed and capacity and is an increase in storage capacity compared to the $700 pc build in previous months. Is 240GB not enough storage for you? Then add more or save for more in the future (see the hardware alternatives for options). The included power supply unit in this pc build is the reputable and affordable Corsair CX Series, CX500, with enough juice to power this build and for a good cost for cheap. The PC case this month is the Fractal Focus G. This case hasn’t been used in this build before and is a unique choice that showcases your hardware aesthetics with style. 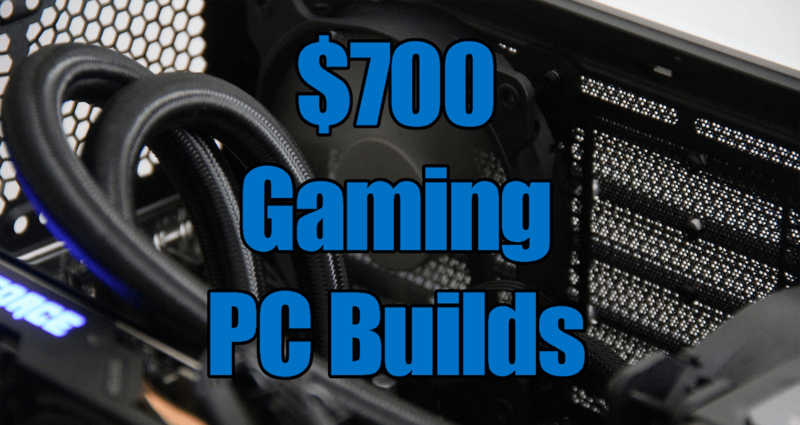 The above are upgrades to the April 2019 $700 gaming pc build. That is if you have more to spend than a $700 budget for this gaming pc build, these are some options for you to increase your overall gaming performance. There are some significant upgrades above including the CPU and graphics card – and even further, if you upgrade the CPU you could also upgrade the motherboard for an even more overclocking capability for even more of a performance boost for nothing. The CPU upgrade suggested is an AMD Ryzen 5 2600X, this could be a slight upgrade in computing power and it overclocks quite nicely (in order to do so, please also upgrade the motherboard). The motherboard upgrade suggestion is an AMD socketed X470 board — the MSI X470GPLUS Performance GAMING motherboard. This motherboard can further leverage the included Ryzen cpu by providing an easier overclocking experience. If you are looking the simplest performance upgrade, then you could consider upgrading the graphics card to an RTX 2060 graphics card, which is a fantastic card and is also included in our March $1000 gaming pc build. You could also increase your storage space by going with a larger capacity 500GB Western Digital 3D NAND SSD. This would be recommended if you think you will need more than 120GB as included in the SSD in the base build above. Looking for a Different Gaming PC Budget?